Enter another world…a world of darkness in the ordinary world. Where in one moment, a person’s life can be turned upside down and the horror of nightmares can become real. The Darkside is waiting and you will never know you’ve entered it until it is too late! 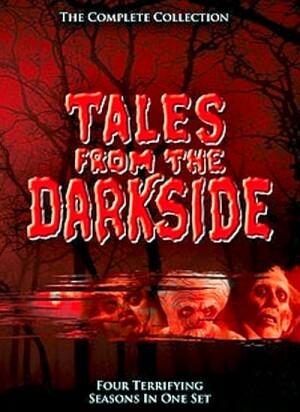 Across four unpredictable seasons, Tales from the Darkside reveals the sinister shadows that dwell beneath the seeming normalcy of our sunlit world. Behind every corner lurks a demonic presence, a deadly secret, or a devious twist. Every episode of this cult-classic anthology series delivers a different shocking story with a new perspective on the reality you think you know. George A. Romero, the mastermind behind Dawn of the Dead, spearheads a roster of incredible talent. Top Hollywood talents turn in unforgettable performances in episodes based on stories by legendary horror scribes like Stephen King, Clive Barker, and Robert Bloch. -- Bonus episodes from the production company that brought you Tales From The Darkside: "Akhbar's Daughter" and "Attic Suite"